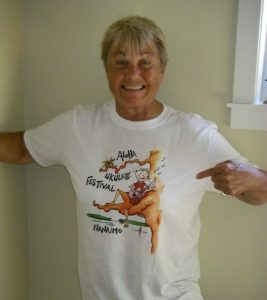 The Nanaimo Ukulele festival began as a one day event in the summer of 2011 and was produced by Anna Lyman, a local ukulele and vocal teacher, who wanted to promote and support the growing interest in the ukulele in the Nanaimo area. What started as a one day affair has grown over the years to become a uke fest celebration attended by people from across Vancouver Island, mainland BC and other parts of North America. Local ukulele enthusiasts and volunteers work to bring together ukulele performers and teachers from the Island and across Canada and the USA. Our goal is to create an event where we can come together to celebrate our love of the ukulele, meet with other “ukesters” and showcase the accomplished and talented ukulele players from across the continent. Carol started playing the ukulele in 2011 with the Harbour City Seniors Nordli group. 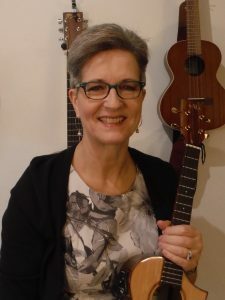 She has been involved in organizing the 2014, 2015, 2017, 2018 & 2019 ukulele festivals in Nanaimo. Carol plays the tenor and baritone ukulele and continues her lessons with her teacher, Flavio Cianflone of the Music Chord. Carol also plays regularly with the Folk’n Oldies group. Carol also mentors two Level 1 Ukulele in the Classroom groups with the Nanaimo seniors program. She is a Certified Level 1 James Hill Ukulele Initiative (JHUI) ukulele teacher and is registered for Level 2. Melissa became interested in the ukulele a few years ago when she heard the Nanaimo Ukulele Circle playing in a local coffee shop. Since then she can’t put her ‘ukuleles’ down. Melissa also plays with the seniors Folk’n Oldies group and says that her playing has improved since joining that group. She studies music with Flavio Cianflone and has recently taken up playing the UBass. To participate in any of the ukulele programs offered by the City of Nanaimo Parks and Recreation contact the Harbour City Seniors program coordinator at 250-756-5200 or visit their website by clicking on the link above. meets on the 2nd and 4th Monday of each month at 7.00p.m.